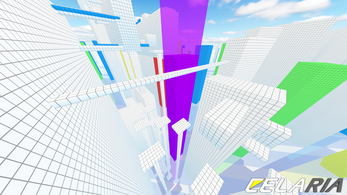 Celaria is a first person parkour platformer with emphasis on fast and reactionbased gameplay. Parkour Moves: Run from the startpoint to the goal as fast as possible. 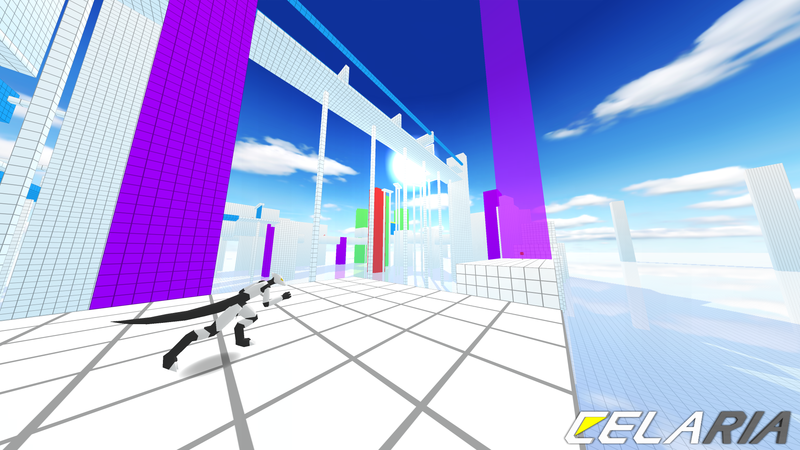 Make use of your parkour abilities like wallruns, walljumps, slides and rolls. Power-Ups: Use the colored blocks to your advantage! They provide you temporary "power-ups". 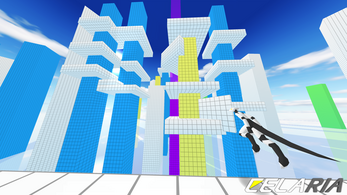 Green blocks allow you to jump higher while yellow blocks double your running speed. 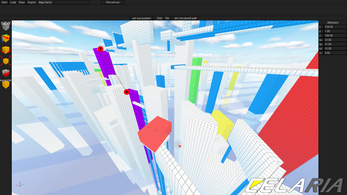 Map-Editor: Create your own maps in the built-in map-editor and share your creations with other players. (In development) Multiplayer-Mode: Create your own server and race against other players. Be aware that the game is still in alpha. You can follow the development of the game on Twitter and Youtube. After that's done simply start the .exe file which was extracted from the zip. Just a couple things I'd like to say myself. 1. Is there any way to bind controls to mouse buttons? I'm quite fond of having my jump on LMB and crouch on RMB in games like this, and I haven't found a way to make this happen in this game yet. 2. Trying to rebind the 'reset' key softlocks the program (not sure if it's actually a hardlock; you can move the mouse but you can't interact with anything or exit the keybind mode). It doesn't seem like trying to rebind anything else does this. 3. Is there a version of this available for Linux? This is a great game! I hope to see more work done on it! 1. 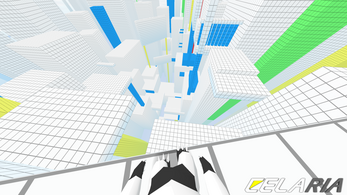 The internal build of the game has the ability to bind the jump and slide/roll button to the left/right mouse button. 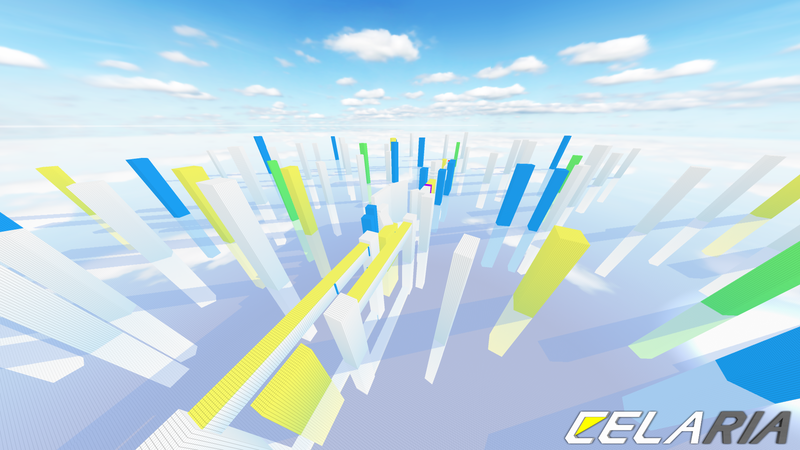 This feature will be available in the final build of the game. When's 6 alpha coming out. How can i get custom maps? amazing work! it really is a lot of fun to get into. you've got a talent for creating games! this game was a ton of fun to play!! love the fast paced gameplay and the music sure does get you going! :D great job on creating this game! DUDES THIS IS SO GOSH DARN DIDDLY DARNED FUN! Like legit, one of the most fun games I've played. I was gonna play something I bought the other day for like $30 bucks, but then played this for a couple of hours instead. Would totally spend money for the full release! Honestly, my only complaint is the playground level. I get that there are mutiple paths, but after I got a ways in, I had no clue how to progress from there. I tried a few different things, but none of them worked very well. I'd suggest some type of optional guidance system, that shows you one possible path to do the level. Since it would be optional, it should show the easiest path to do. I've never played a parkour platformer before I got this one a few days ago, but I've had a MASSIVE ammount of fun with this one though. I do have a few suggestions, though. 2. Menu navigation. Currently menu navigation is only possible with the mouse. It goes without saying that if point 1 is implemented that it should be possible to use a controller to navigate the menu, but I feel like it shouuld also be possible to navigate with the keyboard. Minor, I know, but I feel it would be nice, so I'm mentioning it. 3. "Camera." The "camera" (I put that in quotations because I'm not sure where else to call it, but I'm referring to the direction you look in) itself is perfectly fine, but there IS something that would be useful in a game like this: A button to turn around 180 degrees instantly (For those wondering again, if I were to map said control to my Switch Pro Controller, I would map it to the left stick click). Due to there being places where you have to jump to one platform and turn around in order to jump to the next platform, this would be EXTREMELY helpful, especially for someone using a controller, a laptop (also me), or who just isn't that adept with a mouse (again, me). All that said, I look forward to future updates! This game is a TON of fun, and I'll definitely keep an eye on it! The game is awesome! Are you planning on porting the game to Mac or no? There are no plans for a mac release at this point in time. Great game. Pretty similar to Mirror's Edge, but without the bull crap talking. Surely will buy the game when it comes out. Just one little thing that would be nice is a dot on the middle of the screen so I know where I'm looking. Seems pretty stupid, but it helps. Keep up the good work. That's great! Looking forward to the final release then! Awesome game! I didn't get nauseous or anything, so that's good. I know you want it to be about accurate, precise platforming, but in its current state the lack of good air control is terrible. I keep making jumps that are almost good but if i could just shift a little bit more in the air they'd be good, and i wouldn't have to keep retrying. Otherwise, excellent game! I'm also making a first person platformer, so this was fun to try out and see how other people are doing the same thing. It is actually possible to control your character while in air. It's just very subtle to allow you to correct jumps over longer distances. So i reduced the air control to make this exploit impossible but give the player still enough room to correct his/her jumps. I think the forum is broken. My laptop can't access the site. The issue report says, "www.celaria.com/ didn't send any data." The game was made with Game Maker Studio. :) Also there are currently no plans for a third person camera. EDIT: the game will be free or paid? You can reset the settings by opening the appdata directory (type "%localappdata%" into the windows search bar and press enter.) then navigate to "Celaria_open_alpha_v5\profile\" and delete the config.ini file located in there. Will there be character customization in the beta/finished product? Also, I would request that you make the game free to play, but with purchasable character customization options. Just don't make it Pay-to-Win, trust me, that won't end well, take it from a person who lost his game to the horrid world of P2W. The game will be released on Steam with a regular launch. i cant imagine that u use gms to make this! how can u make 3d animation in gms? how can i convert obj, d3d, gmmod to bao? There is a tutorial on the forum (click on the link which i posted above) which explains how to convert .obj models to .bao animation files. You probably selected a resolution which was higher than your display resolution. Open the localappdata directory (open your windows search bar , type "%localappdata" without the "" and hit enter), then navigate to "\Celaria_open_alpha_v5\profile" and delete the config.ini file in this directory. This will reset the settings of the game. Hey I was wondering if you were planning on changing the wallrun to running into the wall without having to hold jump button (space). This would really help fixing the misspress pattern of buttons. I don't plan to change the wallrun mechanic. Making a wallrun automatic without having to hold the space button is (in my opinion) less intuitive and takes the control away from the player. Not to mention, there might be szenarios where you would want to stop doing a wallrun in mid-air. The current system is the best approach to solving this problem. Hey just wondering if this game will be for mac later in its developement? Currently there are no plans for a mac port. Can you tell me what exactly doesn't work? Is there any kind of error-message which i can look at? This error can sometimes happen if the game can't compile the DirectX 9 shaders. (Some DirectX 10 and 11 installations don't seem to be fully backwards compatible with DirectX 9.) You can fix that by installing the DirectX 9.0c end user runtimes found here: https://www.microsoft.com/en-us/download/details.aspx?id=8109 (It will install the missing bits for DirectX 9).